In undertaking the project to upgrade the wiring of the SL-1200 tonearm there were several things I wanted to accomplish. Keep the unit looking stock. There have been negative comments about the internal printed circuit board used to tie the tonearm wire to the IC cable. To respond to that I designed a 5 turret terminal board to be used in place of the circuit board. 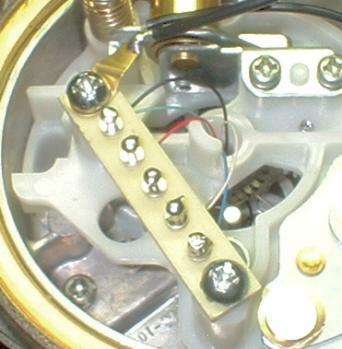 Here you can see the cardas wand wires comming into the base and soldered into the top of the turret terminal board. The terminal board mounts in place of the older original printed circuit board. Plated brass turret pins provide a reliable inteface between the fine tonearm wire and the more robust connecting cable. 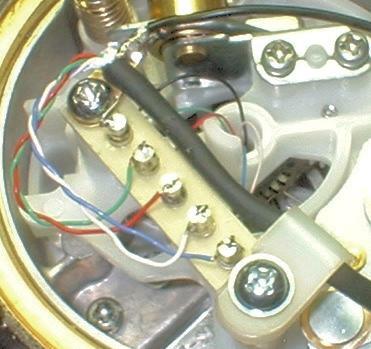 Here you see the Cardas 4 conductor sheilded tonearm cable. The left and right pairs are individually twisted internally. The nylon clamp was later deleted from the mod for it is really unneccesary as the cable is clamped as it exits the top cover. From this point, the cardas toneam cable will attach to the terminal strip and go out through the original bottom plate and clamp to be soldered to the dual RCA's on the PC-1200 connector plate. If the 5 pin DIN is chosen instead, there will be no need for the Cardas tonearm cable. The Cardas wand wire will solder directly to the DIN connector. The advantage of the DIN system is that no signal current travels through the sheild. It also permits connecting to a balanced preamp stage; RCA's do not.